Awareness in Environmental, Social and Governance (ESG) and Sustainable Responsible Investing (SRI) has intensified significantly in the past two years. As ethical investing becomes more commonplace, especially among large institutional investors, and media coverage of the sector’s activity proliferates, ESG and SR investing is set to grow in importance. Recent research has indicated that younger investors are more likely to invest in sustainable investments than otherwise. As such, asset managers and financial institutions anticipate that global demand for socially responsible investment products will soar in coming years. Through its structure and nature, Shariah-compliant finance and investment is supremely well-positioned to take advantage of the growth of ethical and sustainable investing. 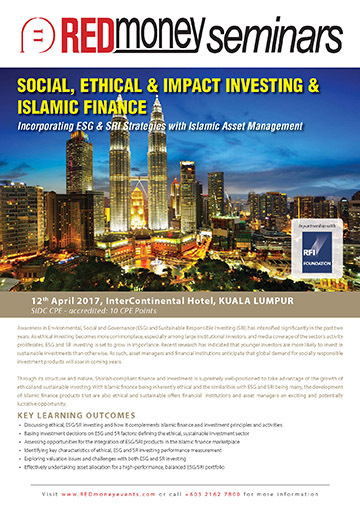 With Islamic finance being inherently ethical and the similarities with ESG and SRI being many, the development of Islamic finance products that are also ethical and sustainable offers financial institutions and asset managers an exciting and potentially lucrative opportunity. 9:00 – 10:45 Session 1: What is Environmental, Social and Governance (ESG) and Sustainable Responsible Investing (SRI) and What Role does it play in the Islamic Asset Management Landscape? Are conventional valuation methods applicable and transferable to ESG/SRI activities?